Every single email address has value attached to it. Every email address you collect is worth something. Of course it has a monetary value, but we shouldn’t reduce something as valuable as this to just a dollar figure. Email is a deeply personal way to adopt people into your inner circle – or the other way around. Getting into someone’s inbox is a privilege, and something we control. Any good marketer will tell you “the money’s in the list” and when it comes to selling wine to consumers, this statement is particularly true. When you get a new customer, you’re getting a possible brand advocate, someone who will share your product with friends, and hopefully come back for years to come. When it comes down to marketing costs, email is the cheapest way to promote your brand. It’s also the easiest and most effective. Services like MailChimp, Vertical Response, and Constant Contact offer affordable platforms to manage your campaigns. A good list will convert 40-50% of your subscribers at least once over the course of a year. In fact, email marketing has the highest ROI of any digital marketing channel. Does email appear as a top traffic channel that drives sales through your website? It should be in the top three. Over the past two years I’ve examined data from countless wineries, and the most successful ones excel at email marketing. In order to see the highest ROI on email marketing, you need to constantly be growing your list of subscribers. This is one area that 90% of wineries struggle to capitalize on. Luckily, it doesn’t take much to collect emails from hungry consumers who visit your site. The good news about working in an industry that lacks technical sophistication is that you find a lot of low hanging fruit to clean up. 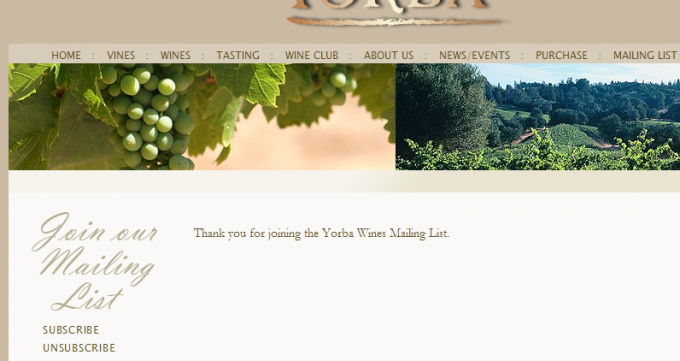 It seems like most wineries just don’t give much thought to actively collecting emails. What you’ll find below is nothing groundbreaking; these are basic tips that should be implemented on any website. In the example above, we made a few simple changes that brought dramatic results. This is primo low hanging fruit, and as you can see, it was ripe with opportunity. Make the call-to-action plainly visible by creating a graphic, adding it above the fold, and ensure it appears on every page of the site. Include a short message that clearly spelled out the benefits of subscribing, and emphasized the one-time promotion they would receive. 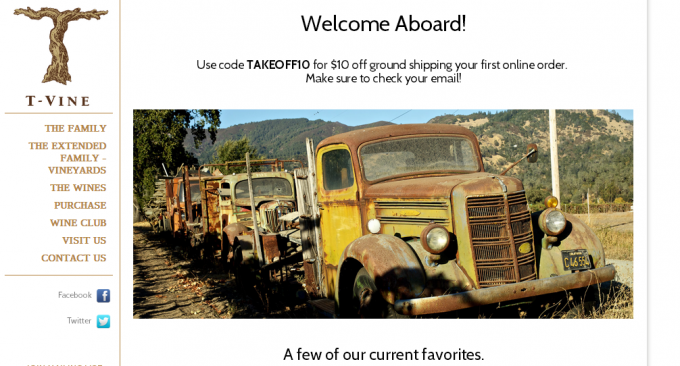 Create a one-time discount promo code to incentivize users and attract more signups. These are just a few of the basic list building strategies that should be used by anyone with an online business. Your website offers an experience for a new visitor, and you need to figure out ways to nudge them down the funnel, migrating them from a casual website visitor to a loyal customer. By using simple and direct prompts to join your mailing list, you can shepherd a lot more people into the top of the funnel. Many wineries put a small link to their mailing list down at the bottom of their website, where few people will ever notice it. Don’t make that mistake. Your mailing list call-to-action should appear near the top of your website, and on every single page. Visit a couple winery websites, and you’ll notice a few common traits. Most of calls-to-action appear below the fold, often at the very bottom of the website. Very few offer any sort of insight into why a visitor would even care to signup. And most signup forms require too much information from the user. Unless you’re doing very targeted geographical offers and sending daily horoscopes, there’s no need to collect their address, date of birth, and other personal information. At this stage, you need only their name and email. Once they become a customer, you’ll get all the rest of their personal details. Kamen Estate does what many do, and asks for way too much personal information. The point is to get a name and an email. You can get the rest of that information once they buy your wine. Become part of our inner circle and get email-exclusive offers, invitations to special events, and the latest news about our winery. We swear on our oldest bottle of Reserve Cabernet, we won’t spam you. The second one is more personal, and makes the visitor feel like they’re getting something special. It’s also reassuring, and manages expectations. Think about what you have to offer, and how you can frame the visitors expecations in a context that gets them excited to be a part of your list. If you’re a small, allocation winery, you could indicate that you’re only accepting limited numbers of signups; for a large winery, you may encourage the visitor to join the rest of the crowd who’s already receiving your great emails. Most wineries display extreme caution and predjudice against offering discounts. They feel like it diminishes their brand’s worth, and in a sense that’s true if they do it too much. I believe a brand risks this when they work with sites like Wine.Woot and Lot18 pushing heavy discounts. They risk deflating their perceived value, and training customers to expect those kind of savings. 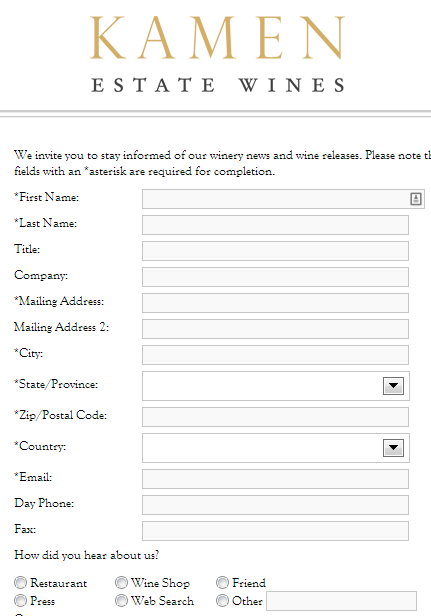 A good many wineries also turn their nose at the idea of offering an explicit discount for new mailing list signups. But all it took in this example was a single use, $10 off coupon to dramatically build their subscribers. But consider this – the average wine order is valued around $250, and the lifetime value of a customer is often many times that. Does paying $10 for a new customer sound like such a bad thing? I didn’t think so. Your incentive doesn’t have to be monetary either. 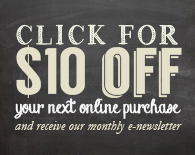 Offer them a resource like an ebook guide to your wine region, and email-exclusive content. Keep them up to date with winery events, news, and upcoming release dates. Between basic incentives like those and larger ones like ebooks and guides, you can find plenty of ideas. This is a wasted opportunity. You just gave someone a $10 coupon, right? Now give them the desire to use it. If someone’s this interested in your brand, why not offer up some of your favorite wines, or present them with a chance to buy a magnum of one of your club-only wines? This should not be the end of your visitor’s journey. Actually, it should be far from it. T-Vine Cellars does a great job of furthering that visitor down the funnel, inching them closer to a purchase. Go ahead, signup and see for yourself. Take a moment to consider how to improve your website to better capture visitor’s information. As you can see, there’s not a whole lot of genius here. It’s mostly common sense, and these are quick wins you can use to drive your direct-to-consumer sales channel to new heights. If you haven’t paid much attention to building a subscriber list, you should easily be able to double or triple your subscriber list by implementing these basic tips. Once you start collecting more emails, the next step is to focus on turning those subscribers into customers and brand advocates. Stay tuned for the followup to this post, where I’ll show you how to create a high-converting welcome email. We’ve been building a few apps in this space, especially around the incentivizing users to perform certain actions that are important to your financial goals. Thanks for the kind words. There’s a lot of low hanging fruit out there that’s waiting to be plucked. Your app looks good, and I like how it brings the user into a deeper level of interactivity. Very creative. Good luck in your ventures!